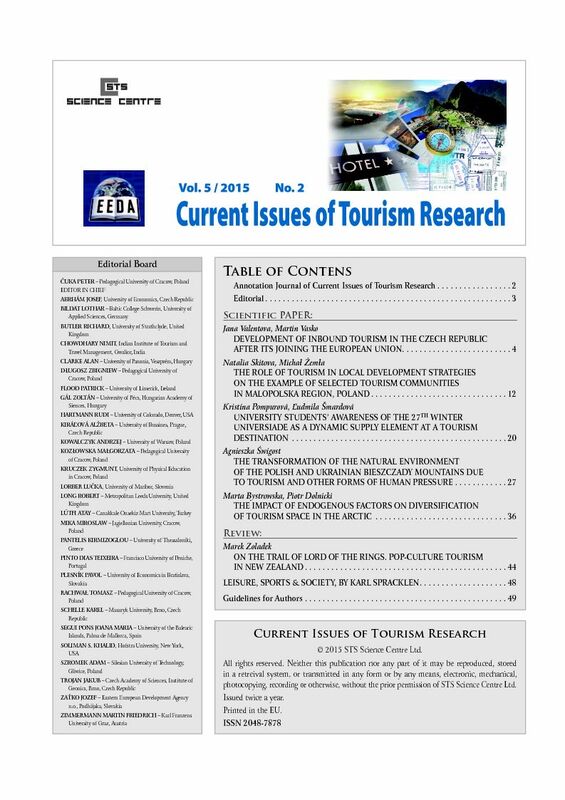 The journal focuses on new problems in tourist regions in Central Europe - trends in the development of terminology, theory and methods of research in tourism; current questions concerning the product, management and marketing of tourism; religion tourism in Central Europe; issues of urban and cultural tourism in Central Europe; Health Tourism, Spa Tourism and Wellness Tourism. The Institute of Geography of the Pedagogical University of Cracow (Poland) does not continue publishing the CITR journal in cooperation with the STS Science Centre (UK) and EEDA (Slovakia). We invite you to read the archival issues. If necessary, please contact with the owner of the rights to the journal title (STS Science Centre and/or EEDA).